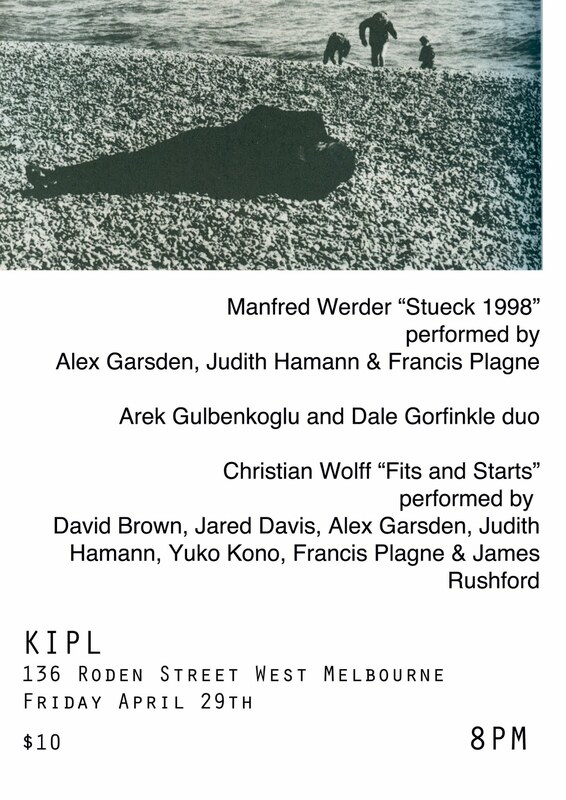 stück 1998 performed by Alex Garsden, Judith Hamann and Francis Plagne. Arek Gulbenkoglu and Dale Gorfinkle duo. Fits and Starts Performed by David Brown, Jared Davis, Alex Garsden, Judith Hamann, Yuko Kono, Francis Plagne and James Rushford. Manfred Werder is a core member of the important and influential Wandelweisser Composers Group, alongside Michael Pisaro, Radu Malfatti and Antoine Beuger. Active since the early 1990s, their music has emerged as one of the most important currents of contemporary music to respond to the challenges posed by the works and writings of John Cage. Often focusing on the possibilities for compositional simplification to result in sonic complexity and the experiential potentials of highly reduced approaches to music, their work features heavily conceptual methods of composition, a focus on the threshold between sound and silence and an interest in extended durations. Werder’s stück 1998 is a 4000 page long piece for open instrumentation, the total duration of which is 533 hours and 20 minutes. The pages are performed successively by different groups throughout world, each page being performed publicly only once. Each page consists of a number of tones, each tone held for six seconds with an equal duration of silence after each tone. Werder views his work as involving an interaction between performance, context and the listener’s experience, and the radical simplification of the musical material stems from his belief that ‘the more balanced the meeting of all parts, the more challenging an event may emerge’. 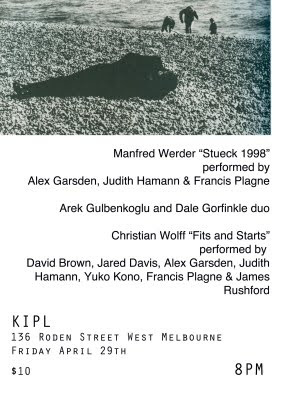 The works of Christian Wolff have been influential on the Wandelweisser Group and he had occasionally collaborated with its members, making his 1971 Fits and Starts a fitting accompaniment to Werder’s work. Wolff’s works are distinctive in focusing on the interactions between the players, often making use of somewhat intuitive systems of cues in order to create interaction that could not be brought about through conventional notations. In Fits and Starts, the challenge for the players is to all independently follow a similar set of loose instructions without following the other players, resulting in a modest yet constantly shifting rhythmic complex. Arek Gulbekoglu and Dale Gorfinkle perform delicate and thoughtful improvisations for snare drum and vibraphone, transforming their instruments with the use of everyday objects and unorthodox techniques into sources of richly textured white noise, semi-randomized rhythms and subtle percussive interjections. They recently released a CD, Vibraphone/Snare on Melbourne label Avantwhatever.